This time of year is an exceptionally beautiful time at the Wister Garden. To step through the woodland’s edge, one feels as if they’ve discovered a secret garden. Walking around the back of the house, one is greeted by a spectacular spring display in a riot of pinks. 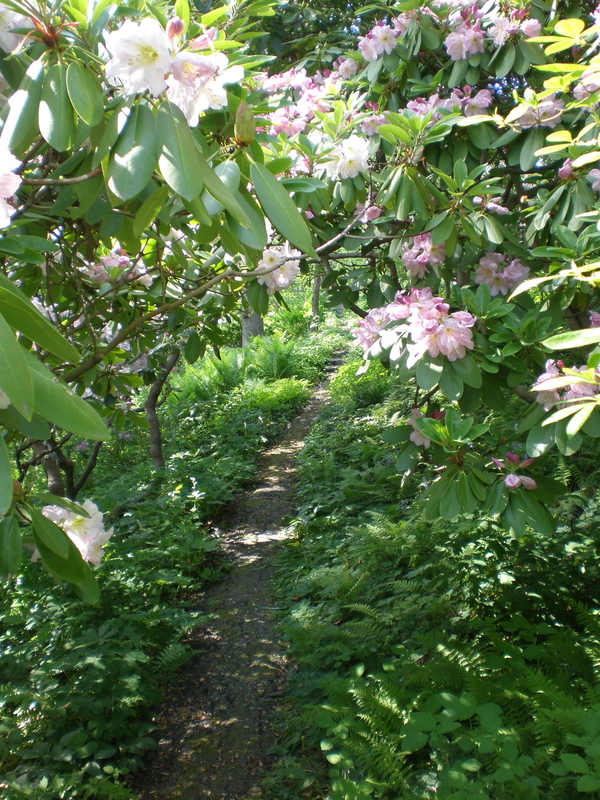 The branches of the many rhododendrons and the Kousa dogwoods hang heavy with blossoms. The paths are lush and inviting, causing you to duck under branches laden with flower clusters bigger than your head. 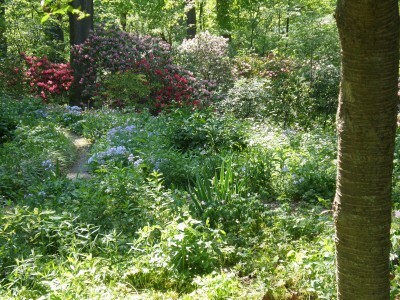 The pinks of the rhododendrons are accented by the pinks and purples of the geraniums and phlox blooming in the herbaceous layer of this woodland garden. Irises are peeking out here and there along the edges of paths. 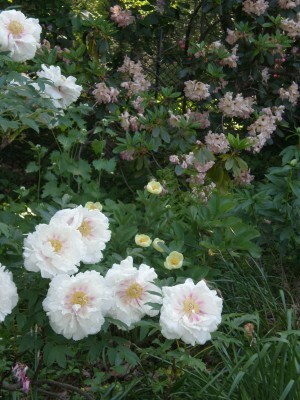 The tree peonies hang heavy with the last of their blossoms while the flowers of herbaceous peonies are just peeking out in shades of white and striking pinks. As the foliage of the winter aconite fades to yellow, the many native ferns are reaching up in a cool green lushness. The trunks and branches of mature rhododendrons frame many views looking down towards the Crum Creek below. Unfortunately, in Monday’s storm we lost the large yellowwood that stood tall at the end of the driveway. Remarkably, it did little damage to the surrounding yellowroot and Hellebores or to any of the nearby rhododendrons. 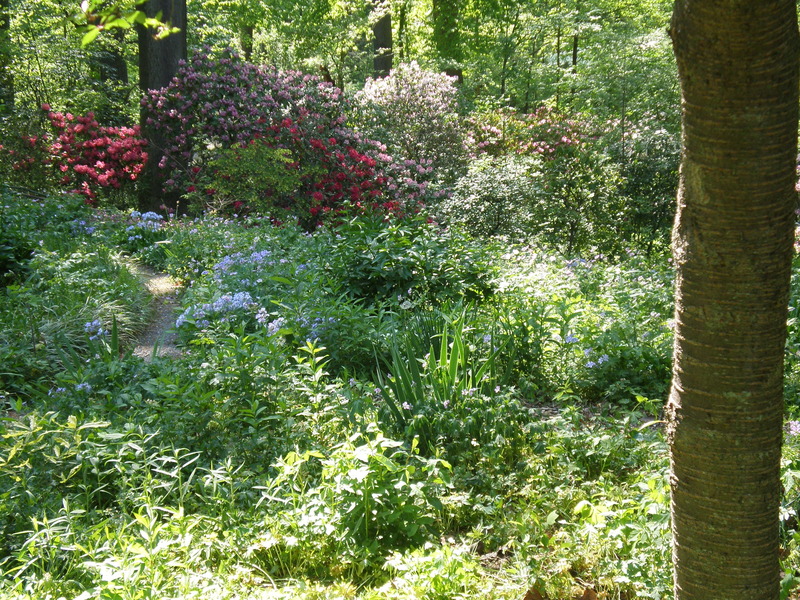 Stop by anytime to experience the wonder of the Wister Garden for yourself.